Why do i need bone grafts? You may need a bone graft for one of several reasons such as: 1) Vertical bone defects around teeth as a result of periodontitis or 3rd molar extractions, 2) To help prevent bone loss and preserve the existing ridge of bone when a tooth is extracted and a future dental implant is desired and, 3) To augment the area where a tooth previously existed or where trauma has occurred resulting in poor esthetics or insufficient bone for a dental implant to be placed. 1) Vertical bone loss around teeth as a result of periodontitis or 3rd molar extractions many times can be treated by a bone grafting procedure known as “Guided Tissue Regeneration” or GTR for short. In this procedure the objective is to try and help the body regenerate that tissue around the tooth which has been destroyed. 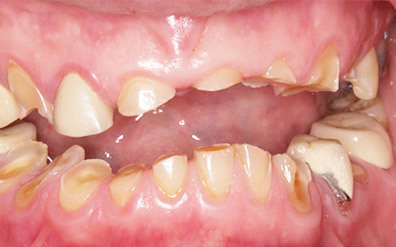 During surgery the gums are folded back and the disease-causing bacteria in the area eliminated. Purified human and/or bovine bone from a certified tissue bank is placed into the defect and covered by a membrane (filter) that the body absorbs over time. These bone grafts act as a scaffold on which the body’s natural bone forming processes work. Many times grafts also release tissue stimulating proteins that encourage your body to regenerate not only the destroyed bone but other tissues necessary for healthy teeth and gums. 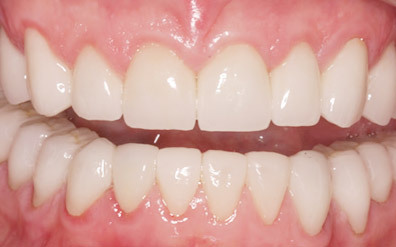 3) When a tooth has been missing for many years or where disease or trauma has significantly reduced the width of the ridge it may create an unsightly appearance or pose a problem for restorative and tooth replacement procedures such as implants and bridges. For implants, there needs to be sufficient bone in order to place a stable, well integrated implant that can support an implant crown that will last for years to come. When insufficient bone exists a procedure called guided bone regeneration or GBR is performed. This procedure is similar to GTR with the exception that it is done where teeth are missing and the bone has already resorbed away, instead of next to a tooth. The purpose of this procedure is to augment the bony area where a tooth is missing in order to create a wide enough foundation of bone to place a dental implant or make the area appear more esthetic. GBR many times can be done at the same time as implant placement. When the ridge or foundation is really narrow, GBR and implant placement are done in two different surgical procedures several months apart in order to increase the likelihood of a successful outcome. WWhere do the bone grafts come from? We get it from a number of sources, but the primary source is from certified donor banks. Just as you can get a kidney transplant, or liver transplant, so too can you get a bone transplant. We call this purified human bone that comes in a sterile bottle an allograft, meaning from the same species. We can also get bone from animal sources such as bovine (cow) or porcein (pig). These types of grafts are known as xenografts. The reason that xenografts work is because the molecular structure of bone is the same across species. Using our knowledge of bone physiology, we know that your body will use the bone as a scaffold and eventually tear down the bone graft and replace it with your own natural bone. When there are large ridge defects and a lot of augmentation is needed, it may be necessary to use your own bone, called an autograft in order to obtain a sufficient amount to fill the large defect. In these situations we obtain or harvest bone from one part of your mouth to use in the deficient area. The most common areas to obtain bone are either from the back of your lower jaw behind the last tooth on what is called the ramus, or from your chin. These types of grafts, as opposed to the small purified bone particles from a bottle, are normally blocks of bone that need to be fixated (screwed) to the defect area and allowed to integrate over 3-5 months. We use a Piezetome (a surgical instrument) to harvest these block grafts which greatly reduces the post-operative discomfort and speeds the healing in both the donor and recipient sites. The donor site heals very nicely with the body filling in these enclosed areas with new bone without you even knowing bone has been cut away. Another alternative to the autograft blocks are the very large blocks of bone that can be obtained from donor banks. This is called the Puros® block graft (an allograft). The biggest advantage of the Puros® block graft is that there is no donor site! This saves you significant post-operative pain and swelling as well as giving a predictable block of bone every time. The only disadvantage is the additional cost of obtaining the block from the donor banks. Many patients however, find the additional costs are well worth it in terms of accelerated post-operative healing. How safe are bone grafts? To date, out of the millions of bone grafts that have been done, there has never been a single case of disease transmission. Studies have even been done where the bone grafts were “spiked” with a virus’ and then put through the purification process to see if they can survive and they don’t. You can rest assured that we get our bone from the most reputable sources such as Puros, LifeNet and the American Red Cross.